Joseph B. 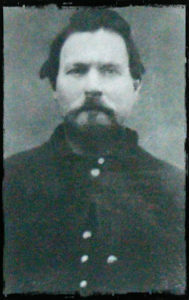 Chambers was born May 4, 1833 in Beaver County, present day Lawrence County. Enlisting at East Brook in February 1864, he served in Company F of the 100th Pennsylvania Infantry. He was wounded at Petersburg, Virginia on March 25, 1865. Complying with an issued order, Chambers advanced and came upon a hidden sunken road, a road that had been cut through a slight elevation. Hidden in the near bank of the road were Confederate soldiers, lying in a double line of battle. A Confederate flag was planted in the middle of the road. Chambers jumped down over the soldiers lying in battle line, and grabbed the flag. He struggled with the confederate flag bearer whose fellow soldiers for whatever reason, withheld fire. He was successful in gaining possession of the flag by the time other Union soldiers arrived who then charged and overtook the Confederates. With the flag in his possession he started back toward the rear to turn the flag into the headquarters as regulations required. On his way he encountered a Confederate Major on horse back and Chambers, a private, demanded his sword. A demand he had no right to make. Without question, the major complied and handed it over, asking Chambers if he had anything for him to drink! Chambers turned in the flag, but kept the sword. Chambers was award the Congressional Medal of Honor for his actions in connection with his capturing of the enemy’s flag. The sword remained in possession of the family. In the 1990’s his grandson’s widow lent the sword to the Museum of the Confederacy in Richmond, VA where it was reunited with the flag that he captured in battle. At the age of 75, Joseph B. Chambers died on October 8, 1908 of liver cancer, secondary to cancer of the breast that had been removed the previous year. He was buried at Oak Park Cemetery. Chambers’ and Cyrus B. Lower’s bravery are recognized and honored by a memorial at the Lawrence County Court House, that was unveiled on Veteran’s Day, November 13, 2000.